Anheier, H.K. and Anheier. (2012). Immigration. In H.K. Anheier & M. Juergensmeyer (Eds. ), Encyclopedia of global studies. [Online]. Thousand Oaks: Sage Publications. Available from: https://search.credoreference.com/content/topic/immigration [Accessed 21 April 2019]. Anheier, Helmut K., and Anheier. "Immigration." Encyclopedia of Global Studies, edited by Helmut K. Anheier, and Mark Juergensmeyer, Sage Publications, 1st edition, 2012. Credo Reference, https://search.credoreference.com/content/topic/immigration. Accessed 21 Apr. 2019. Immigration not only profoundly affects population dynamics but also has far-reaching economic, social, and political consequences for both destination countries and countries of origin. As such, immigration has global significance. It has also typically been a contested issue and remains one of the most controversial policy fields in virtually all countries. Immigration is the entry of a person into a political unit, usually a state, with the aim of establishing permanent residence. This process involves the transgression of a ratified boundary by which nation-states demarcate, thus making immigration an inherently political act even without the recognition as such by the immigrant. Figure 1 offers an overview of migration flows at the beginning of the 21st century. It shows a pronounced flow from lesser developed parts of the world to better-off regions, as measured by the Human Development Index. The United Nations estimated in 2009 the total stock of immigrants at roughly 194 million people. One third of the overall number of immigrants are moving from the global South to the North. The United States harbors the greatest absolute number of residents whose country of birth differs from their current country of residence with 42.8 million; this figure equals 13% of the entire U.S. population. In addition, more than 30% of U.S. citizens are either first-or second-generation immigrants. The Russian Federation is home to 12.3 million foreign-born residents; Germany follows closely with 10.8 million, and is, after the United States, the country with the relatively highest share of nonnative population among the larger economies. However, resource-rich countries with smaller populations tend to have the highest rate of immigrants per capita. This is the case in the Middle East, which hosts 19 million immigrants, of which 9 million—mostly from Bangladesh, India, Pakistan, and the Philippines and Sri Lanka—are dispersed through the Gulf States and make up approximately 85% of the region's workforce. Immigrants by far outnumber native residents in Qatar (87%), in the United Arab Emirates (70%), and in Kuwait (69%). Immigration in Africa is both modest and commonly intracontinental (a trend mitigated for northern African states) with South Africa topping the list of destination countries with an immigration population of 1 million residents. Note that immigration data do not include internally displaced persons. Moreover, refugee flows in war-torn regions and among failed states are poorly documented. Source: United Nations Development Programme. (2009). Human development report 2009: Overcoming barriers: Human mobility and development (Map 2.1, p. 24). Palgrave Macmillan. Used with permission. Immigration is a modern phenomenon because it involves the crossing of state borders and thus differs from earlier population movements such as the Barbarian invasions (300 to 700 CE) after the fall of the Roman Empire or the migration patterns of the Middle Ages in Europe generally, or migratory patterns in the Sahel, central Asia, Micronesia, and Australia. International migration streams have proceeded in two waves: The first wave was characterized by immigration from Europe to North America and parts of Latin America, and reached its climax in the middle to late 19th century. After the two world wars and the global economic depression caused large-scale cross-border movements to ebb, a second wave began in the 1960s and accelerated during the 1990s and into the new millennium. Specifically, the first wave was about a “European exit.” The 17th and 18th centuries saw a steady influx of a limited number of European settlers into North America and—albeit to a lesser degree—Latin America. By 1820, 2.6 million immigrants had entered North America. Their migration soon coincided with a connected movement of 8.7 million African slaves to the southern United States. Thus, coerced migrants made up 77% of the total immigration pool until the early 19th century. These numbers changed dramatically from 1820 to 1850 with the annual inflow of immigrants growing from 13,000 to 275,000. The wave was largely driven by European workers and farmers who, in 1850, made up 96% of all entries to the United States. Between 1820 and 1850, a total of 60 million Europeans left Europe to find a better life in the New World, emigration also proceeding in waves that first affected western European countries before spreading to southern and later to central and eastern Europe (Hatton & Williamson, 2006). The second wave was less about European immigration to the United States, Canada, Latin America, Australia, and South Africa and more about population movements from the global South to Europe. Since the 1960s, immigration has largely changed direction and Europe has become a destination for, rather than the origin of, migration. Moreover, whereas the United States has retained its status as a destination country of immigration, Latin America has changed to an origin country of migration predominantly to the United States, particularly for Mexico and other Central American countries, as well as Peru, Colombia, and Argentina. As of 2005, Europe equaled North America in the number of immigrants with a total of approximately 44 million foreign-born residents. All European states recorded a marked increase in (East) Asian immigrants during the Asian boom years of the 1980s, and immigration numbers have further accelerated since the 1990s. Overall, the United Kingdom and France have seen a large influx of citizens from their former colonies while Italy and Spain are the primary destinations for immigrants from northern Africa, and Germany is home to large immigrant populations from Turkey, Italy, Greece, and the Balkans. In addition, western Europe has experienced heavy influx from central and eastern European states with the end of the Cold War with the annual number of immigrants reaching 1.2 million in 1993 and leveling off at 700,000 in the later 1990s. Although individual decisions to migrate may be based on the need to escape political repression or the lack of religious freedom, or, in other cases, may represent a response to natural disasters, most immigration seems to be rooted in the prospect of economic betterment. Thus, Timothy Hatton and Jeffrey Williamson highlight three factors that determine immigrations flows. First, immigrants compare wage rates and unemployment rates in their countries of origin as well as in potential destination countries. If potential migrants observe the wage gap to be considerably tilted toward foreign countries and perceive a reasonable possibility in obtaining employment, they decide to immigrate to the destination (this is called the “pull effect”). Second, potential immigrants have to overcome a financial threshold that allows them to leave their country of origin. Although rapidly decreasing costs in transportation have lowered this threshold, the amount of money needed to undertake the journey to a destination of immigration is, for many people in developing countries, still substantive. Thus, emigrants do not usually come from the least developed countries and usually do not belong to the poorest social strata or reside in the most underdeveloped regions of developing countries. Third, where financial constraints are still high enough to prevent emigration, their effects are frequently mitigated by remittances, that is, funds sent from already immigrated family members, thus allowing potential immigrants to overcome the “poverty trap” (the last two points being important “push effects”). Whereas immigration during the first wave was largely unregulated (at least until the 1880s) and often subsidized by destination governments to attract immigrants (e.g., the U.S. Homestead Act), the second wave has taken place amid high legal and bureaucratic barriers imposed by national administrations, which P. A. Bárcena calls the “mercantilization” of immigration. Since the end of the 19th century, governments have utilized four broad policy tools to manage the flow of immigrants entering a state. First, they have introduced quotas to limit the absolute influx of foreign-born residents. Second, they have devised a variety of guestworker systems in which foreign workers enter a country under the premise to re-emigrate after a specified amount of time. Such a system has been most prominently employed in Germany but also in the Low Countries, while Gulf States rely on a foreign-born labor force that is equipped with temporary contracts usually not exceeding 2 years. Third, states have issued visas on the basis of skill levels to positively select immigrants after functional needs by their respective labor markets. Organisation for Economic Co-operation and Development (OECD) countries usually favor highly skilled immigrants while some countries are additionally seeking unskilled laborers in sectors like health care or construction. Fourth, governments have legislated regulations regarding the acceptance of refugees into their polities. These tools regulate the entry of immigrants via the issue of documents that prove the legality of the immigrant's entrance into a destination state. However, OECD countries have seen a substantial influx of undocumented or illegal immigrants, that is, persons who enter a state without the authorization by national authorities. The International Organization for Migration estimates that roughly 50% of current immigrants to OECD countries enter undocumented, and the International Labour Organization suggests that illegal immigrants make up 10% to 15% of the global immigration population. Illegal immigration presents unique challenges for both immigrants and governments, the former frequently facing non-contract-based occupational arrangements, which usually open the door for wage discrimination and poor working conditions. Undocumented immigrants largely enter through networks of human traffickers and smugglers, who have increasingly come to provide the necessary financial impetus to migrate. Thus, illegal immigrants sign “debt contracts” and repay their “loans” either directly through labor or through a share of future wages. Barry Chiswick identifies three policy responses to undocumented immigration: First, border enforcement by state patrols or the erection of walls. Second, the internal enforcement of immigration regulation; this mechanism refers to practices where illegal immigrants are not targeted directly but where, for example, employers in a destination state are sanctioned with severe fines for employing undocumented workers. Third, states have resorted to granting amnesty for illegal immigrants as practiced in France in 1982, in Argentina in 1984, and in the United States in 1986. Immigration has a major social impact on destination countries that ranges from economic issues to matters of identity and a sense of belonging. The respective societies in OECD countries, especially in Europe, have struggled to fully integrate immigrants; yet the result has been high unemployment, low literacy rates, and a “ghettoization” of many immigrant communities. These developments in turn, have led to reoccurring outbursts of violence of male immigrant adolescents, which culminated in France in the October riots of 2005 that left more than 1,000 cars burned and more than 200 public buildings severely damaged. Popular belief often attributes a negative impact of immigrants on wages and living standards, which deepens rifts caused by divergent (often religious) value systems. Furthermore, international migration has severe negative effects on the societies of immigrants’ countries of origin as it leads to a “brain drain” in developing states. Ten percent of the highly skilled individuals from the developing world currently live in Europe, North America, or Australia, with the number rising to the range of 30% to 50% for those foreign-born residents who have received training in science and technology (Magner, 2010). Thus, for both destination and origin countries, the international regulation of migration would yield positive effects. However, no international organization has enforcement authority for migration as, for example, rests in the World Trade Organization for international trade. Although international conventions about migration and immigrants exist, they are primarily aimed at guaranteeing certain rights to refugees and immigrant workers and at protecting immigrants from abuse by human traffickers. Although the Global Commission on International Migration recommended in its final report in 2005 the creation of a global agency to deal with the consequences of international migration, the implementation process has thus far not gained significant traction. Azkona, E. M.(2006) On the inclusion of the children of immigrants in European societies. The French riots of 2005. In Gruber, R. S. & Maiztegui, C. (Eds. ), Immigration: Views and reflections(pp. 57-87) Bilbao, Spain: University of Deutso. Bárcena, P. A. (2006) Immigration and labor market: Reality and future perspectives. In Gruber, R. S. & Maiztegui, C. (Eds. ), Immigration: Views and reflections(pp. 207-244) Bilbao, Spain: University of Deutso. Chiswick, B. R.(2001) The economics of illegal migration for the host economy. In Siddique, M. A. B. (Ed. ), International migration into the 21st century(pp. 74-85) Cheltenham, UK: Elgar. Hatton, T. G.Williamson, J. G.(2006) Global migration and the world economy: Two centuries of policy and performance. Cambridge: MIT Press. Inter-American Development Bank. (2006) Sending money home: Leveraging the development impact of remittances. New York: Inter-American Development Bank Multilateral Investment Fund. International Organization for Migration. (2008) World migration 2008: Managing labour mobility in the evolving global economy. Geneva, Switzerland: Author. Magner, T.(2010) Immigration. In World at risk: A global issues sourcebook(pp. 3-23) Washington, DC: CQ Press. Massey, D. S. Immigration statistics for the 21st century. Annals of the American Academy of Political and Social Science, 631, : 124-140, . United Nations. 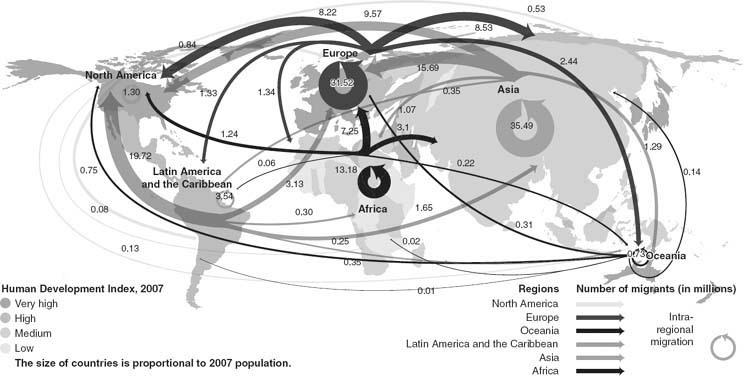 (2009) International migration 2009. New York: Author. Full text Article Fact Check: are there over a million foreigners living illegally in Britain?